The Rotary Harrow is very well suited for breaking up soil crusts, which makes subsequent manual tillage much easier. Due to its crumbling action, it is ideal for weed control and mulch seed crops. The springoperated supporting arms ensure very good ground adaptation. In combination with a Pneumatic Seeder (PS), the Rotary Harrow covers the seed with fine earth and harrows it in. The Grassland Pro Harrow GP 300 M1 and GP 600 M1 is very well suited for meadow cultivation, for reseeding and the new seeding of grass. Due to the unique combination of 12 mm and 8 mm tines, the sward is optimally processed. 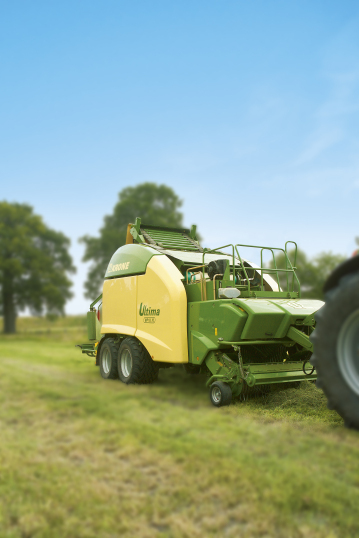 The Grassland Harrow GS 600 M1 is used mainly in areas where increased grassland cultivation is necessary. The two powerful front tine rows pull out matting and weeds, while the two weak back tine rows separate the earth from the pulled out matting and weeds and work the spread grass seeds into the soil. Our Grassland Harrow GS 300 M1 can be used single as well as in combination with an existing roller, given that the GS 300 M1 can be used in front. If needed, the reconsolidation of the sward can be done with the roller at the rear. This leads to a balanced weight distribution, which facilitates particularly work on slopes. Fleming Landlevellers can also be used to level out equestrian centres, race tracks and running tracks. The Fleming Mounted Grass Harrow Range is compatible with a wide range of horsepowers which makes Fleming the perfect option for the hobby farmer/gardener or the large agricultural farmer.